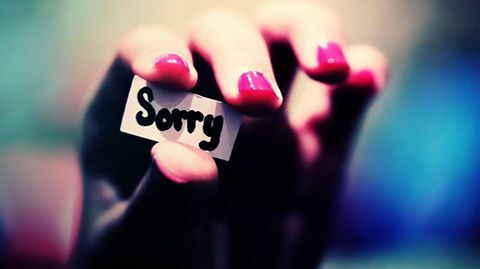 When it comes to apologies, we are admonished that if someone apologizes we should forgive them from our heart. It has also been said that we shouldn’t try to judge the sincerity of ones apology but at the same time people can kinda tell when you are being genuine or not. In other words are you sorry or just SAYING you’re sorry? I know some will be quick to say, “well I wouldn’t say it if I didn’t mean it and he just better accept it.” Which is true, he should just accept it and with no reservations but if we are honest, we know sometimes we don’t always mean it. And there in lies the problem, it shows. Therefore I say, when you are wrong you don’t just owe him an apology, you owe him BEING sorry. Believe it or not there is a HUGE difference. If you have apologized but the situation didn’t change maybe the problem was not that he didn’t forgive you or that he is holding a grudge but that you broke his leg and the amount of damage control you offered was like a band aid because it didn’t seem that deep to you. Am I suggesting that you should be made to grovel for every little offense NO – no one should HAVE to be made to grovel but at the same time if you think groveling is beneath you, what is your true purpose in apologizing? OR maybe you hurt him deeply and he responded in kind, so either you didn’t feel the need to apologize or your apology wasn’t really sincere because you were waiting on him to “be the man” and apologize first. OR maybe you only apologized for what you thought was wrong or important to you but not for what actually caused the damage. Regardless of the scenario, if you were the one at fault then 1) you need to ensure the damage has been properly and thoroughly assessed and 2) adequately taken care of first THEN the discussion can begin about what you are owed. We pay thousands of dollars a year for insurance companies to RESTORE things back to normal before the problem whether we were at fault or not. Next articleWHAT ABOUT THE MAN?